Nowadays, we believe that cancer is a genetic disease. We focus on the genetic targets and epigenetic changes in a tumor. Remarkably, many crucial signal pathways in a malignant cell involve “stem-ness” genes. The prevalence of stem-ness in cancer suggests that cancer has a stem-cell origin and is a stem-cell disease. The observation that many innate stem-ness properties are easily interchangeable with malignant hallmarks needs to be further elucidated. There appears to be a malignant potential in every stem cell and a stem cell potential in every malignant cell. I hypothesize that cancer is a stem-cell disease rather than a genetic disease. We will use homeobox genes to endow a certain progenitor cell with specific stem-ness properties and confer different stem-cell phenotypes to the particular cell type in a hierarchical manner. We will demonstrate that an earlier homeobox gene plus a genetic defect (such as Pten loss) tend to form a more virulent tumor, while a later homeobox gene plus the same genetic defect tend to express a more indolent phenotype. Importantly, we will show that in clinically relevant cancer subtypes, those with worse clinical outcomes may paradoxically harbor fewer genetic mutations than those with better outcomes do. The recognition that cancer is a stem-cell disease will instigate major paradigm shifts in our basic understanding of cancer. Many fundamental principles of oncology, such as multistep carcinogenesis, need to be reconciled. The realization that cancer is a stem-cell disease will also have profound clinical implications on personalized care. Many aspects of our current clinical trials need to be reevaluated. Despite our increased knowledge and better understanding of cancer, we are still quite clueless about its exact origin. Although genetic and epigenetic mechanisms play a critical role in the development of cancer, their relevance depends to a large extent on the right cellular context and the microenvironment. Considering all the various aspects of cancer, we notice a common thread that unites cancer, namely “stem-ness.” Stem-ness accounts for the dormancy, regeneration, heterogeneity, immunity, and metastasis of cancer. It seems that stem-ness is not only intrinsic but also integral to cancer (Figure 1) [1, 2]. Cancer and stem cells. Cancer cells (top panel) and stem cells (bottom panel) are like mirror images of each other. There appears to be malignant potential in every stem cell and stem cell potential in every malignant cell. Reprinted with permission from Springer . The idea that cancer has a stem-cell origin is not new. In 1863, Rudolf Virchow first promulgated a stem-cell theory of cancer . In 1959, Barry Pierce performed seminal experiments that reignited interest in this field . Recently, many prominent investigators have provided scientific evidence that validates, if not proves, the theory of a stem-cell origin of cancers . However, to my knowledge, no one has yet hypothesized that cancer is a stem-cell disease. An indispensable component of the stem-cell theory is the interplay between cancer and the microenvironment. In many respects, a stem cell is inseparable from its stem-cell niche, just like a cancer cell is from its onco-niche. This is best illustrated by classic experiments in which normal stem cells derived from the genital ridge formed teratomas when placed in an exogenous site , whereas teratocarcinoma cells formed parts of a normally developing mouse when implanted into the inner cell mass of a blastocyst . Further, Rous sarcoma virus did not induce sarcomas in chicken embryos , and B16 murine melanoma cells failed to form tumors in the embryonic skin . Houghton et al. performed a pivotal experiment that proved the stem-cell theory of cancer. They demonstrated that bone marrow–derived stem cells traveled to the Helicobacter-infected stomach of C57BL/6 mice and were the source of gastric carcinoma. Recently, many other investigators have devised ingenious experiments to elucidate the identity of cancer-initiating cells with stem-ness properties at well-known premalignant sites [10, 11] and in disparate malignant tumors [12–14]. It is important to emphasize that the idea of cancer being a stem-cell disease goes beyond the idea of cancer stem cells (CSCs). It may be the key to resolve the controversy of whether CSCs are derived from stem cells, acquire stemness features, or merely mimic stem cells . A reservation about the existence of CSCs concerns experiments showing that CSCs and non-CSCs (ie, differentiated cancer cells) are interchangeable, suggesting that CSCs may be a transient rather than a unique entity [15, 16]. However, it is plausible that unknown populations of CSCs not detectable by currently available “stem-cell markers” (e.g., CD44+, ALDH) are present in those assays. Otherwise, why would a small percentage of non-CSCs (i.e., 0.4/300 of HME-flopc-CD44lo cells) form mammospheres ? Why would sorted CSCs fail to stably propagate, and yet there was a constant proportion of CSCs within the transformed population ? Interestingly, Zhao et al. demonstrated that induced pluripotent stem cells (iPSCs) from somatic cells reprogrammed with stemness factors have stem-cell features. But iPSCs are not embryonic stem cells (ESCs). Unlike teratomas arising from ESCs, tumors derived from iPSCs are duly recognized and rejected by the immune system of syngeneic immunocompetent mice . Another reservation about the existence of CSCs relates to the role of the microenvironment and how the stroma affects initiation or progression of cancer [18, 19]. Hence, epigenetic alterations in the stroma are sufficient to initiate formation of carcinoma and precede the development of any mutations in adjacent epithelial cells . But the fact remains that the involved epithelial cells affected by the stroma have stem-ness characteristics, because they have the capacity to regenerate whole organ systems . Interestingly, Reticker-Flynn et al. reported a novel way to block metastasis by focusing on specific cellular interactions rather than particular gene mutations . They demonstrated that metastatic cells selectively associate with fibronectin in combination with galectin-3, galectin-8, or laminin (which constitute the stem-cell niche) through α3β1 integrin (which is expressed by CSCs). It is ironic that the missing piece in the genetic theory of cancer may actually be the centerpiece in the stem-cell theory of cancer. I hypothesize that cancer is a stem-cell disease. I propose that our traditional view of cancer, that cancer has a genetic origin and is a genetic disease, is incomplete. Although mutations do cause cancer, the idea that we need to fix a particular mutation to cure cancer is fallible. For example, prostate cancer may contain 3,866 somatic base mutations per tumor and 90 chromosomal aberrations per genome . Perhaps we only need to focus on the so-called “driver genes.” But many of these driver genes actually have stem-ness properties . The pervasive idea that cancer may arise from any cells in the body is also untrue. For example, innumerable key oncogenic defects (e.g., p53, PTEN) are also found in nonmalignant cells [23, 24]. If accumulation of mutations causes progression of cancer, and the rate of mutation is relatively low in humans (i.e., <200 new mutations per diploid genome per generation) , then there is insufficient time for the mutations to occur and accumulate in a somatic cell with a limited life span (e.g., skin, 30 days; gut, 3 days) . Perhaps “genetic instability” can account for this discrepancy. But genetic instability is also traceable to a vital stem-ness trait, namely asymmetric division . According to the stem-cell theory of cancer, the type of cell in which a genetic mutation occurs is just as important as (if not more so than) the mutation itself during carcinogenesis. I hypothesize that the same mutations which affect earlier cancer-initiating cells may also affect later progenitor cells in a stem-cell hierarchy. Paradoxically, earlier cancer-initiation cells that form more virulent tumors may require fewer mutations to become malignant than later progenitor cells that form more indolent tumors do, because their inherent stem-ness obviates the need to acquire more mutations. After all, many stem-ness properties are also potential malignant hallmarks (Figure 1). We can test this hypothesis by using homeobox genes, which provide a particular progenitor cell with specific stem-ness properties that confer different stem-cell phenotypes to the same cell in a hierarchical manner. Hence, an earlier homeobox gene plus a genetic defect (such as Pten loss) in a particular cell type may form a more heterogeneous tumor that metastasizes more widely, while a later homeobox gene plus the same genetic defect in the same cell type is likely to express a more restricted and indolent phenotype. Importantly, we can show that in clinically relevant cancer subtypes, those with worse clinical outcomes tend to harbor fewer mutations than those with better outcomes do. The recognition that cancer is a stem-cell disease will instigate major paradigm shifts in our basic understanding of cancer. Many fundamental principles of oncology need to be reconsidered and reconciled. For example, a paradigm shift is in order regarding dedifferentiation of cancer. Does a cancer cell become dedifferentiated from a mature differentiated cell, or does it merely reveal its undifferentiated stem-cell features? Also, if a late event like metastasis occurs early during carcinogenesis, it contradicts our classic model of multistep carcinogenesis, which assumes that cancer becomes more metastatic as it acquires and accumulates increasing numbers and types of genetic mutations. The idea that cancer is a stem-cell disease rather than a genetic disease may alter the entire landscape of cancer and revamp the whole groundwork of oncology. The realization that cancer is a stem-cell disease has profound clinical implications on cancer care, including personalized care. Many aspects of our current clinical trials need to be revisited and reevaluated. I anticipate that personalized care based on a specific cellular entity would be more efficacious than that which is based solely on a specific genetic mutation within it. After all, a common link between the cancer-initiating cells with stem-ness properties and the mutations they contain is the cell of origin. Consequently, when we target an aberrant cancer-initiating cell with its whole package of genetic mutations rather than the individual mutations themselves, we are treating a whole system of intracellular, intercellular, and microenvironmental pathways or networks. Currently, our clinical trials are not designed to assess the therapeutic effects and potential benefits of agents that target CSCs or cancer-initiating cells with stem-ness properties. We need to be cognizant that treatments that target CSCs may provide delayed therapeutic benefits, because of a lag in the detection of perceptible clinical improvement. Otherwise, promising treatments could be prematurely abandoned unless and until we develop therapeutic strategies to account for the presence of CSCs and response criteria to monitor the effects of therapy on them. When clinical trials are designed to target appropriate patient populations with specific cancer subtypes and relevant CSCs, we predict that the overall patient survival time may improve for a few years, rather than just a few months. When we conduct clinical trials on the basis of a correct and pertinent cancer hypothesis, we save money, time, and lives. S-MT is Clinical Professor in the Department of Genitourinary Medical Oncology at The University of Texas MD Anderson Cancer Center in Houston, Texas. He earned his undergraduate degree from the Johns Hopkins University, Baltimore, Maryland, and his medical degree from Washington University in St. Louis, Missouri. His article, “Stem-cell origin of metastasis and heterogeneity in solid tumours,” was published in Lancet Oncology in 2002, and his book, Origin of Cancers: Clinical Perspectives and Implications of a Stem-Cell Theory of Cancer, by Springer in 2010.
properties or potential that make a stem cell, including effects from the stem-cell niche. I thank Karen F. Phillips, ELS(D), a professional medical and scientific manuscript editor in the Department of Genitourinary Medical Oncology, The University of Texas MD Anderson Cancer Center, for editing this paper. I also thank Herbert C. Bradshaw for his comments and insights. This work was supported in part by the National Institutes of Health through MD Anderson’s Cancer Center Support Grant, 5 P30 CA016672. 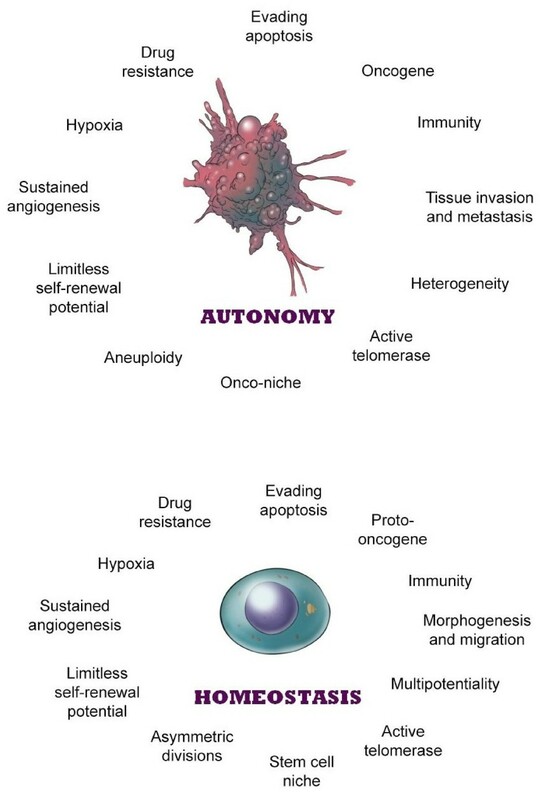 This article contains ideas from the author’s book, Origin of Cancers: Clinical Perspectives and Implications of a Stem-Cell Theory of Cancer. Proceeds from this book are dedicated to cancer research. S-MT is the sole author of this article.